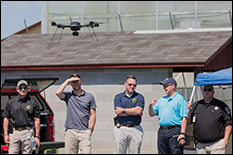 On Tuesday, June 7, the University of Maryland Unmanned Aircraft Systems Test Site hosted a Project Lifesaver demonstration of the Lockheed Martin Indago UAV system for 15 representatives from nine public safety organizations. The UAV was equipped to carry a small antenna with an option for cameras, thereby allowing Project Lifesaver-trained first responder agencies to dramatically reduce search times and significantly increase search area for special needs individuals who wander and have gone missing. The system can speed up the location and recovery of missing individuals wearing a special transmitter bracelet. It is used to support patients who suffer from Alzheimer's, dementia, autism, and other cognitive disorders. The UMD UAS Test Site supports civil/commercial applications of UAS and UAS research in public safety. Agencies participating in the demonstration included Charles County MD Emergency Services, Charles County MD Sheriff’s Office, Fairfax County VA Fire & Rescue, Fairfax County VA Sheriff’s Office, Prince William County VA Sheriff’s Office, York-Poquoson VA Sheriff’s Office, Delaware State Police, FBI Washington Field Office, and Thin Blue Line LLC.